Prepare yourself for the end of days with this handy overview of the upcoming set: War of the Spark. Then get ready for battle one week earlier on the 27th of April when you preorder through Outpost! For several sets now I've been reminding players that everyone's favourite planeswalking dragon, Nicol Bolas, is still out there. He's been a bit absent from the last two sets but, much like Thanos, he was just biding his time waiting for the right moment to strike. To continue my comparison to the MCU: 'War of the Spark' is pretty much 'Infinity War' for Magic The Gathering. 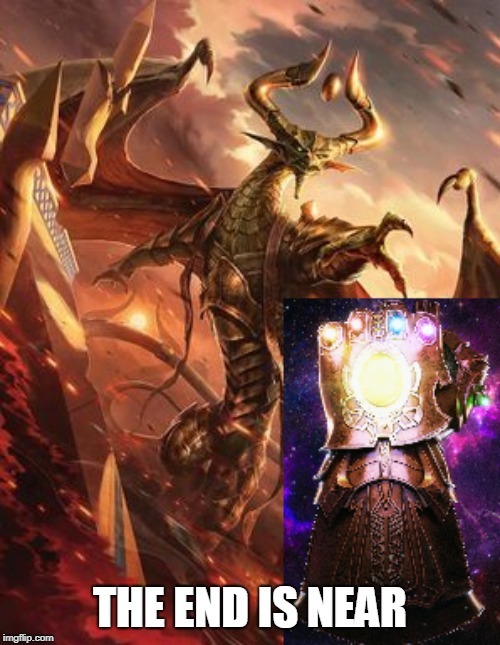 Only now we're not fighting a big blue alien with a gauntlet, but a badass dragon with an army of eternals. Fortunately the gatewatch remembered to bring backup this time. In the form of 36(!) planeswalkers ready to bring the fight to the dragon-lord before he ascends to godhood and becomes unstoppable. There's just a little problem .... It's all part of Bolas' plan. War of the Spark could very well be the most exciting set in quite a while (story-wise at least) now that the entire Bolas-arc is finally coming to an end. Because this is such a special event the set itself will feature something new as well. No longer do we care about the guilds of Ravnica (they've had their day in the spotlight). It's all about the planeswalkers and their attempt to stop Bolas from achieving his goal. That's why the set will feature 36(!) planeswalker cards. In fact: every booster pack you buy is guaranteed to have a planeswalker card in them. Other cards in the set will enhance and 'synergise with' those planeswalker cards. Do keep in mind that if you buy your products in our physical stores during our prerelease weekend (27th-28th of April) you will get a 10% discount (except on single cards). This discount does NOT apply when preordering on our website through the links above. We hope to see you on the battlefield. After all, we wouldn't want all future sets to just be about Bolas' infinite reign. That would get boring real quickly.